What’s an electrical engineer doing, deep inside a tiger reserve? 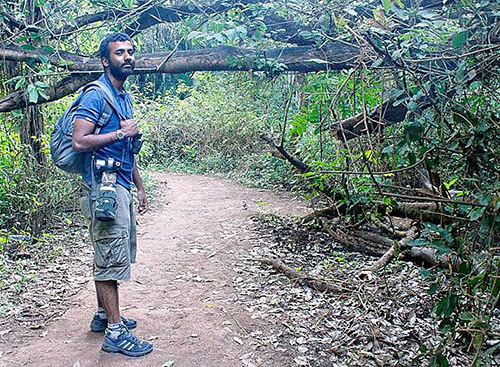 Well, Surya Ramachandran is training young aspirants to be successful guides and tour leaders. Surya says that he was interested in wildlife right from childhood - his first trip to the zoo with his art teacher sparked off a whole new interest in him. He has been visiting various national parks ever since, both as amateur and professional. Surya currently works at the Singinawa Jungle Lodge in Kanha. 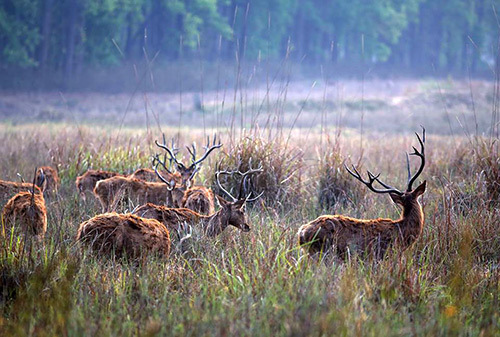 He was earlier with the Forsythe Lodge near the Satpura National Park – one of the finest tiger reserves in the country. Surya’s interests include birding, butterfly watching, herping and frogging. These are terms used by naturalists to describe their research areas of interest. Smaller mammals and other hard-to-spot species form the basis of his treks into areas that are still nature’s preserve. His interest in photography and video help him capture and document all his work, which he shares freely on social media. We now chat with Surya about developing new interests, trips to forest reserves and protecting wild life in our forest lands. Q: As a naturalist, are you concerned about the intrusion of tourists into natural habitats? To answer your question, when a large number of people enter a national park on a daily basis, there is always a case of intrusion into a very private world. I too take groups of people inside the park – twice-a-day, through most of the year. But I always manage to keep forest etiquette in mind, and the need to be non-intrusive during these visits. The role of a naturalist is all important – and has a lot to do with exploring, understanding and interpreting the magic of the wilderness. We also need to explain our findings using simple, easy-to-understand terminology. In addition to guiding tourists in and around the park, a naturalist also helps people build meaningful relationships within these spaces - the objective here is relate to your surroundings in a constructive manner. At another level, any amount of good or neutral presence in national parks is useful, and necessary – because we also need the kind of awareness that goes with it - to protect our parks from poaching, and infuse support measures such as manpower and funds. Q: Isn’t a forest-and-nature trail an excellent learning platform for children? Children who are 10 to 15 years old are at the right age to learn new ideas and concepts – because they are curious and wanting to know more. The ones below ten could be a little too early for this experience – though they could be started off with relevant books, videos and nature study classes. Simple activities like planting a tree, learning the parts of a flower, studying animal tracks, and creating a nature notebook can go a long way in increasing awareness - about life outside the four walls of a classroom. Even visits to villages around forest areas and seeing how people live can be interesting. Helping milk a cow, using a hand pump for water and working in a green field, can give them rare insights into a world they have never seen, or visualized. What I am talking about is learning at the grassroots level – by seeing, doing and getting their hands dirty. Q: How do adults (the big boys) stand to benefit from getting closer to nature? The big boys are different - and I need to reassure people that adults aren’t always reluctant participants, or learners. For adults in most cases, a visit to a natural park has a lot to do with the fear of the unknown – their fears are often larger than they need to be. And as I have seen, most of them get their calling in the form of birding, tree spotting or photography – they actually like being able to do something different, unusual and engaging outdoors. City wildlife clubs and societies can also play a useful role in raising awareness, before they graduate to jungle retreats. Another thing with adults is the need for numbers – a nice like-minded set of friends with similar interests can be useful and motivating. Q: What tips would you give people going on a safari within a forest reserve? Go with an open mind - accompany your naturalist and let him educate and entertain you in the many ways he can. Always be receptive and ready to learn. Try and attempt at least one nature walk on outstation trips and vacations. There’s so much you can learn outside your comfort zone. Always carry a pair of binoculars to help you observe birds, insects, fauna and flora. A camera captures images you want to take away – a pair of binoculars helps takes you real close and helps you make observations. Leave your phone and laptop behind. When you’re on a nature trail for instance, you need to unplug from any communication device that connects with your work place. Finally, one of the thoughts I would like to leave behind here is the need for commitments from stake holders. Owners of timeshare resorts near national parks must join hands in raising awareness levels about conservation and the need for planned investments from the right quarters. One of the ways of doing that is through carefully managed tourism – when there’s money coming in, it can be allocated to local programs that deserve to be supported.